These plans can only be put in place by smaller trading companies and groups. The Government introduced the EMI rules so these kinds of companies could choose to attract and retain the people they need to develop and grow by offering share incentives with generous potential tax advantages. Therefore EMI plans tend to be put in place by companies whose shares are not publicly traded or by smaller AIM companies- although a few listed companies may also be able to offer them. There is an individual limit on the value of shares (as at the grant date) which any one employee may hold under an EMI option. It is a very generous limit, currently £250,000. Options under any CSOP operated by the company also count towards this limit. There are detailed conditions. Some are company conditions and some are conditions you have to satisfy as an employee. There is considerable flexibility in how companies structure these plans and the types of shares that can be used, so it’s particularly important to consider carefully the information that your company provides. The information on this website can only be very general. EMI plans offer options. Those options usually require you to pay an exercise price in order to exercise them, but it doesn’t have to be the same as the market value of the shares. The main option terms must be set out in a written agreement, which must also provide details of any restrictions on the shares. When shares are not publicly traded, it can be difficult for companies to make arrangements so that employees can sell shares if they want to. it can also be difficult to know for sure what the shares are worth, unless there are people buying and selling them. Unlisted companies can formally agree the value with HMRC. But they don’t have to – the company can use its own valuation, or can ask its advisers to carry out a valuation, although if the value hasn’t been agreed with them, HMRC could subsequently argue, for instance, that the company has used a value that was too low. qualifying trading activities. It is the company’s job to look into this. Activities such as dealing in land, financial trading, leasing and property development are examples of non-qualifying activities. Size. The company (or group) must not have ‘gross assets’ exceeding £30 million at the option grant date. not more than 250 full-time employees. In calculating the number of employees, all employees of “qualifying subsidiaries” (i.e. 51% subsidiaries) are counted. An employee working 35 hours per week (or more) is counted as one full-time employee, and the company must include fractions representing part-time employees. £3 million overall limit. There is an overall limit of £3 million on the total value of a company’s shares which can be under EMI options at any one time (valued as at the grant date). £250,000 individual limit. There is an individual limit of £250,000 on the value of shares over which any one individual may be granted EMI options (again valued as at the grant date). 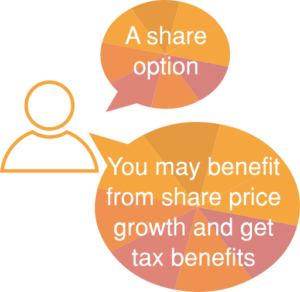 Options under any Company Share Option Plan operated by the company also count towards this limit. Working time. In order to qualify, employees (including executive directors) must spend at least 25 hours per week, or if less, 75% of their working time, on the business of the company (or group). If you are to be granted EMI options, you will have to give a written declaration confirming that you meet this working time requirement. Can’t already have a significant interest. EMI isn’t available to the main shareholders and those close to them. If you have a “material interest“ (broadly a 30% interest) in the company or any of its subsidiaries, either on your own or together with one or more ‘associates’, you can’t have EMI options. Sometimes the test of who is ‘associated’ can be quite tricky. What is the option exercise price? This will be set out in the option agreement. The company can set this at any level. It could be nil. More often, the exercise price is set at the company’s assessment of market value at grant (there may not be any external market for the shares if they are not publicly traded). Growth in value after the grant will normally only be subject to the capital gains tax rules. If the share value at exercise is greater than the exercise price it would normally be worth exercising the option – although you might want to check first how easy it would be to sell the shares if that’s what you are planning to do at some stage. If the option exercise price is set at a level that is less than the market value at grant then that discount can be taxed at the time of exercise. This will be set out in the option agreement. Some plans allow you to exercise the option as soon as you want (although the timing can affect the tax treatment). Some provide that the exercise period only begins after a period of employment. Some plans, known as ‘exit plans’, only allow you to exercise once there is a buyer for the company (and therefore some cash that can be used to pay you for your shares). There don’t have to be any, but usually there are. The employment conditions or vesting schedule will be set out in the option agreement. There don’t have to be any. Sometimes the company thinks it is enough of an incentive that the option will be worth more if the share price rises. Sometimes the company needs certain performance requirements to be met before the option can be exercised. If there are performance conditions, these will be set out in the option agreement. The tax information on this page concentrates on EMI. For other tax information, click through to our Tax page. The benefits of EMI tax treatment depend on the conditions being satisfied. One of the key ones is that the grant of the EMI option is notified to HMRC within 92 days after the grant date. No income tax or national insurance contributions on grant. Normally no income tax or national insurance contributions on exercise except (broadly) if the exercise price is below the market value of the shares at grant. Growth in value isn’t taxed as earnings at all so long as all the conditions continue to be satisfied. If the exercise price is below the market value at the grant date, in other words the EMI option is granted at a discount, then exercising the option will normally give rise to an income tax and liability on the difference between the market value of the shares at the grant date and the exercise price. If the market value of the shares at exercise is lower than the market value of the shares at the grant date, the taxable amount will be limited to the difference (if any) between the market value at the date of exercise and the sum of the exercise price and any amount paid for the option. Except in the rare cases where there are no trading arrangements for the shares, the income tax will be collected under the Pay As You Earn system and national insurance contributions will be due. HMRC has provided some worked examples. If the shares are restricted securities for tax purposes, which is often the case for shares that are not publicly traded, you may be deemed to make a ‘section 431 election’. This happens under the tax rules and it protects you against surprise tax charges later. However, if the option exercise price was set below market value, this election isn’t ‘deemed’, you actually have to make an election if you decide a ‘section 431 election’ is required or is advantageous. Normally an election is a good idea and quite often the company will require you to make one when the option is granted. Just occasionally, a ‘section 431 election’ will increase tax liabilities on exercise. This can be a bit complicated. Here is a link to some information provided by HMRC. An election of this kind can be made when an option is first granted, or it is possible to make an election at any time up to 14 days after the shares are acquired on exercise of the option. Both you and the company have to make the election – it is a joint election. The EMI rules don’t provide any protection from tax charges that can arise if shares are convertible. For instance in certain circumstances set out in the company’s Articles of Association, the EMI shares may convert into other kinds of shares. If it is necessary for the shares to be convertible securities, the company should be prepared to tell you more about the tax implications but it won’t be able to give you individual advice. In these circumstances, EMI options may still deliver significant tax savings, but they will not protect against these particular tax liabilities. This can be complicated and you may decide you need your own professional advice. Capital gains tax may be charged on the sale of the option shares depending on your individual circumstances, including whether your capital gains tax annual exemption is available. The starting point for working out whether capital gains tax arises will normally be the exercise price plus any amounts that were charged to income tax on exercise (for instance because there was a disqualifying event and the option was not exercised within 90 days). If you hold other shares in the company you will also need to think about the capital gains tax share identification rules. Where the sale of the shares is more than 12 months after the date of grant of the option, Entrepreneur’s Relief will generally apply to reduce the rate of capital gains tax to 10% (on the first £10 million of lifetime gains). But you will lose entrepreneurs’ relief if the option is exercised after a disqualifying event and that event happens within the first 12 months after the grant date.For disposals of shares from 6 April 2019, the 12 month period is increasing to 24 months. If one of the conditions stops being met, that can mean there is a disqualifying event in relation to the option. That can mean EMI treatment is lost in part. Growth in share value up to that point normally retains its tax protection. However, income tax and, if appropriate, national insurance contributions are charged on the growth in value between the date of the disqualifying event and the date of exercise unless the option is exercised within a 90 day period. The company being taken over (unless the EMI option is ‘rolled over’ and exchanged for a replacement EMI option granted by a new parent company. The company stops meeting meet the trading activities requirements. You stop satisfying the working time requirements. Be careful if you are taking special leave or you are working for more than one employer. You leave and no longer work for the EMI company or any of its subsidiary companies. Variations to the option terms, unless very minor. Normally the company would seek professional advice before asking you to agree to any changes. The company making changes to the share capital or share rights in a way that is caught by the EMI tax rules. Granting you a CSOP option that causes you to go over the EMI individual limit. If the company grows bigger, that isn’t a disqualifying event, but it may mean the company can’t grant EMI options any more. To be a qualifying EMI option, the grant of your EMI option must be notified to HMRC electronically on Form EMI 1 within 92 days of the grant date. This is the company’s job- but there’s no harm in checking, ideally well ahead of the deadline. HMRC can enquire into the eligibility of the EMI option (generally within 12 months of the grant notification period). If it does not enquire and all information provided is correct, the option is deemed to qualify. The company has to provide information to HMRC about EMI options- for instance if they know there has been a disqualifying event, they have to tell HMRC. You are granted a special type of share option. Tax-advantaged treatment can apply right from the outset so long as you exercise in accordance with the rules of the plan and/or the terms of the option. If the share price at the time of exercise is higher than any exercise price you have to pay, it is sensible to think about exercising your option. You have to pay the exercise price, if there is one. Sometimes the company will offer a cashless exercise so you can fund the exercise price (and any employment taxes) by selling shares. Most people benefit from their capital gains tax annual exemption if they make a gain when they sell their EMI shares. If you sell your shares and the gain is big enough, there may be capital gains tax to pay. If there is, it’s up to you to pay it, the company doesn’t do this. Click to the Tax page. Entrepreneur’s relief may reduce the rate of capital gains tax. If your EMI option was granted at a discount, the difference between the exercise price and the market value of the shares at the time of exercise is subject to employment taxes. If there is a disqualifying event, tax-advantaged treatment only protects growth up to that point, unless you exercise your EMI option within 90 days of the disqualifying event.